The battle against Fats, Oils and Grease is on. Aging city sewer systems are being choked off by, as it’s known in the industry, “FOG”, and the buildups and the debris they collect. The resulting sewer backups are tough on strained city budgets; not to mention a costly health-hazard for businesses and homeowners. As the primary source, the food service industry has come under increasing scrutiny from regulatory bodies to minimize the amount of grease that pours down the kitchen drains. But, with some technological innovation, there are efficient and effective ways to manage this situation. Enter the Grease Interceptors. These devices provide restaurants and other food-service facilities the means of separating FOG from wastewater. Most jurisdictions across North America now require Grease Interceptors to be part of the wastewater system. Non-compliance can result in fines, but also clogs and odours occurring on-site. The fundamental function of how a GI works is actually quite simple. The difference in specific gravity between water and grease means they will separate; you’ve likely seen this occur in your own kitchen, the grease rises to the top. 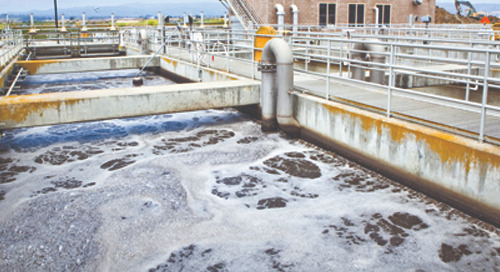 Where things get complicated is managing the volume of FOG-filled wastewater that flows down the drain of a busy restaurant or institution. Hydromechanical Grease Interceptors (HGI’s) provide a reliable solution to dealing with commercial-sized quantities of grease. Endura® Grease Management has developed Grease Interceptors with the ability to control the flow of wastewater – ensuring an optimal rate for maximum separation of grease. By regulating the flow correctly, negative air pressure is created; this causes air and grease globules to bind together, which enhances the buoyancy of the grease, making separation more effective. The influent flow is then directed toward an integral ramp that sends the air and grease upwards. As the flow moves through a diffuser, the grease and water separate. Grease is retained at the top of the chamber and the water remains beneath. The clean water then passes through the outlet baffle near the bottom of the HGI and proceeds out into the waste-water system. The retained grease can then be cleared out at specified intervals – generally, 90 days being the maximum length of time between removals. An important consideration when sourcing a GI is their lifespan. Metal and concrete models are susceptible to corrosion. Endura® GIs have been developed using thermoplastics; making them resistant to bacteria and corrosion – greatly increasing their lifespan. And because the units are smaller than traditional GIs, they’re far easier to install and take up less space. To the average restaurant, those are efficiency factors that cannot be understated. For compliance purposes and for the sewer-system safety, managing grease effectively is no longer an option. Choosing the right management option can ensure businesses in the food industry are getting the most effective, longest-lasting system for their investment.